In addition to extensive bike infrastructure, Copenhagen is a hotbed for innovative mobile apps connecting cyclists. Photo by Claudio Olivares Medina/Flickr. 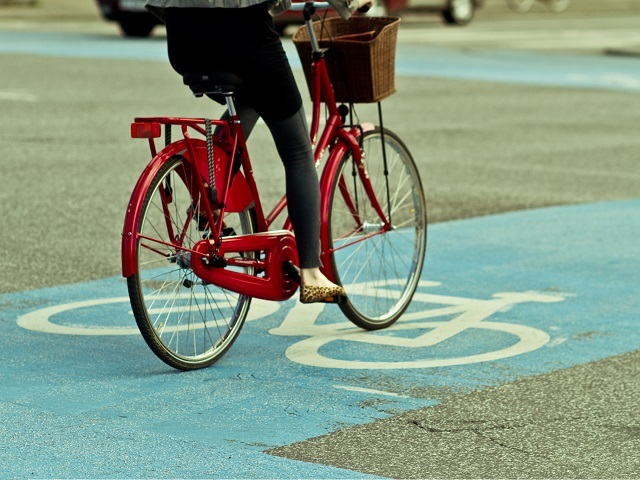 Cities can do a lot to promote cycling, but the private sector and civil society can play a significant role in helping build a safe and convenient cycling culture. For example, innovative startups in Singapore and Copenhagen are developing mobile apps to make bike share even more flexible and user-friendly repairs more convenient than ever. By reducing the need for hard infrastructure, these innovators are creating informal bike share programs that can better respond to local context and needs. In 2015 a group of university students in Singapore launched ZaiBike, a bike share system that is inexpensive, accessible, and available 24/7. Users can locate and reserve available bikes—which Zaibike has purchased and equipped with their technology—via a mobile phone app, and they have 10 minutes to get to the bike and unlock it. At the end of their journey, they can leave the bike anywhere near their destination. Singapore has experimented with bike share in the past but gave up due to low ridership. There was another attempt in 2014 when the Land Transport Authority issued a call for proposals and industry studies on how bikeshare could be implemented in the country, but no formal program exists to date. ZaiBike’s founders believe that cycling is often the cheapest, fastest, and most convenient way to cover shorter distances. They also recognize the benefits that come with a less infrastructure-intensive bike share system. Unlike more formal bike share schemes, ZaiBike does not require specially manufactured bikes or docking stations. In addition to being more flexible and space-efficient, the system can easily be scaled up by simply acquiring more bicycles. Launched at the Singapore University of Technology and Design, ZaiBike is currently working to expand to areas of the city that are farther from the university campus. The team is mindful of Singapore’s particular culture and infrastructure, including strong interest in mobile phone technology and potentially limited space for bike parking, and is continuing to design a system that is sensitive to the local context. On the other side of the planet, innovators in Copenhagen recently started Donkey Republic, a bike sharing system that has been likened to Uber and Airbnb. As with ZaiBike, Donkey users can locate, book and unlock bikes with an app at any time of day or night. However, one unique feature is that Donkey allows individuals to turn their bikes into rentals. Users are able to select a specific type of bike, which has either been purchased by the startup or is loaned out by bike shops and private owners. Owners can purchase a “donkey kit” containing an app-operated lock, a handlebar panel with instructions for the rider, and stickers to identify the bike as part of the system. Once a bike is in the Donkey system, the owner is free to rent it out. As of now, this system lacks the type of flexibility that ZaiBike provides – so far Donkeys are only available at 15 specified locations across the city, though this may increase, as the startup aspires to expand to over 20 countries. Donkey Republic’s founders believe their system overcomes common frustrations with public bike share systems, such as lack of available docking space when a rider wants to return the bicycle or is charged extra fees for a journey that takes longer than expected. For bicycle owners who may be deterred by the inconvenience of flat tires, another Copenhagen-based startup called Cycle Savers is coming to the rescue. This bike repair app brings the mechanic to the rider, anywhere, anytime. Those in need of help use the app to set their location, select a service and request a mechanic. The mechanic contacts the customer to arrange a time, then shows up and repairs the bike. This system is flexible and convenient, removing the limitations of bike shop hours and locations, and enabling people to work as mechanics on a flexible and freelance basis. These startups prove that fresh ideas, motivation, and mobile technology can make it easier to bike in cities. What are your favorite bike apps?